Morgan has a broken arm, elbow and has minor shoulder damage but was in good spirits when I spoke with him a short time ago. As I said in my The Dark Knight review, Morgan Freeman makes any movie he’s in an automatic 3/5 simply because he’s The Man. Good to hear that he’ll be OK. Get well Morgan. Morgan Freeman photo from David Sifry’s flickr page. I always get nervous when I hear about good actors/actresses getting sick/injured, etc. I was so sad when Heath Ledger died… Although I have yet to see Brokeback Mountain, I liked him in other movies he was in. Now, if something were to happen to John Leguizamo or Simon Pegg, I may have to boycott Hollywood because I’d be too upset. Stefanie, the email subscription should work now. Looks like I was missing a quote in the code, sorry for the inconvenience and thanks for pointing it out to me! Justin, Shawshank is the greatest movie ever. 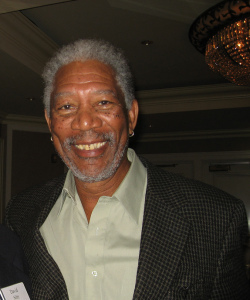 Morgan Freeman is a great actor and a wonderful person. I wish him to get healthy and well.